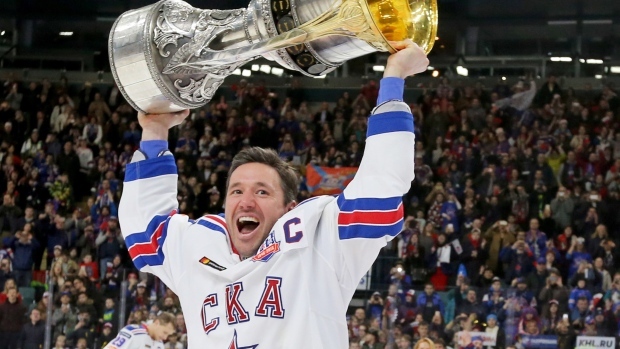 Fresh off a Gagarin Cup victory with SKA St. Petersburg, two-time National Hockey League 50-goal scorer Ilya Kovalchuk has reportedly made his interest in a return to the NHL known. But as TSN Hockey Insider Bob McKenzie notes, a comeback for the now 34-year-old Kovalchuk could be complicated. 1. Kovalchuk remains property of NJD as he is on the Voluntary Retirement List (VRL) so he is free to sign with them for coming season. First and foremost, Kovalchuk remains property of the New Jersey Devils. When Kovalchuk told the Devils of his intentions to retire and return to Russia in the summer of 2013, he had 12 years and $77 million remaining on a 15-year deal signed in 2010. Kovalchuk is on the Devils' Voluntary Retired List (VRL), meaning that his easiest route back to the NHL is with the Devils. 2. If Kovalchuk doesn't want to return to NJ, he could sign with ANY team as long as EVERY other team in NHL signs off on it. Not a chance. If a return to the Devils isn't something the 2001first overall pick in the NHL Entry Draft is interested in, he could always sign with another NHL club - but with a major caveat: every other team in the league would have to sign off on that deal. As McKenzie suggests, that is highly unlikely to happen. 3a. Because Kovalchuk is on VRL, NJ can't trade his rights to any team unless Kovalchuk signs with NJ first. So sign and trade possible. Could the Devils trade Kovalchuk's rights? Yes and no. 3b. Note: Only way Kovalchuk can come off VRL is by signing with NJ. Player on VRL can't have rights traded. Thus, sign and trade is req'd. As long as Kovalchuk remains on the VRL, his rights cannot be traded. In order for a trade to occur, he'd have to be activated from the VRL by signing, so in order for a trade to be facilitated, Kovalchuk must ink a new deal with the Devils first. In 816 NHL games over 11 seasons with the Devils and Atlanta Thrashers, Kovalchuk notched 417 goals and 399 assists.